While the early second generation Camaro was not loaded down with body decals it did have a stripe kit and we have that for you! 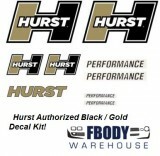 We also have a great selection of Hurst Brand logos, pin stripes and the application gels for make your project go smoothly. For use on you 1970 1971 1972 1973 Camaro. Roll Pin Striping 150 Foot Roll Produced By Phoenix Graphix VARIOUS COLORS! SLIDE ON® Application Gel (pint) & SLIDE OVER UV Pump Sprayer 8oz. 1970 - 1973 Camaro Body Decal / Stencil Kit Various Models!